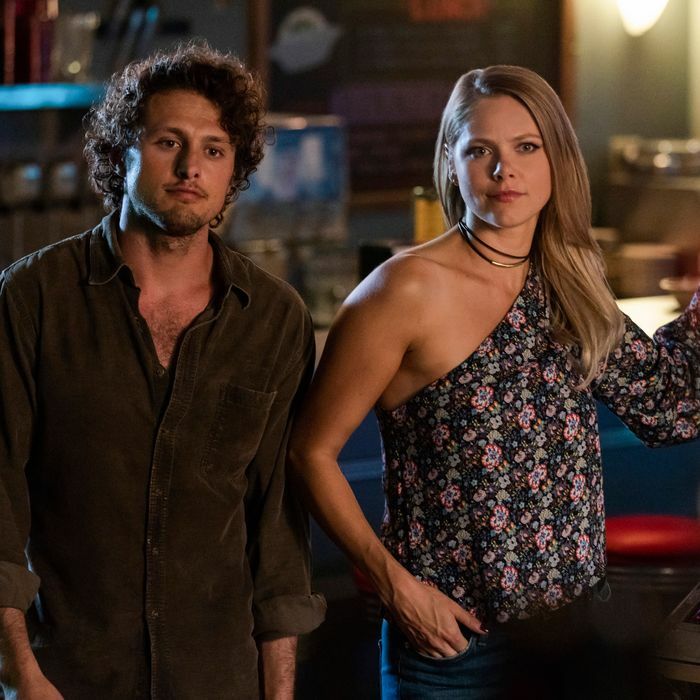 There’s a lot of emotional whiplash happening in the romances of Roswell this week, as Liz and Max’s simmering chemistry gets curtailed by some creepy revelations about the night of Rosa’s death, Max pivots from Liz’s rejection right into a friends-with-benefits situation with his cop partner Jenna (Riley Voelkel), and Michael and Alex … oh, we’ll get there. Liz is at Rosa’s grave as the episode opens, and Max is there, too, a coincidence that Liz doesn’t yet have reason to attribute to anything more sinister than Max being a low-key stalker. On the ten-year anniversary of Rosa’s death, Liz is grappling with a lot of anger toward her sister for the reckless choices she made. (When her father insists that Rosa loved her, her response is brutal: “No. I loved her.”) The only silver lining to this terrible day is that Liz’s handprint has almost faded, which means she can soon kiss Max with full and enthusiastic consent. She asks him to meet her “at the old turquoise mines at sunset” to make out, which is honestly about as good as invitations get! But Max can’t muster much excitement because he knows Liz is smart and is going to figure out that he’s a liar, and also because as a Tolstoy fan he knows better than to believe in joy. Later, Liz is in church, so of course Max is there, too. On this occasion she asked him to meet her, but I’m pretty sure he would have shown up regardless. She begs him to share his memories of Rosa with her through the handprint, “so I can feel her again.” There’s so much natural anger that comes with being the relative of an addict, and when the person dies of their addiction, your anger has nowhere to go but inward, where it festers and poisons your memories. Liz’s desperation to recover some good memories of Rosa rings very true to me, and Jeanine Mason plays this scene beautifully. Max agrees to do it but is squirrelly as hell, because his memories of Rosa are the last thing he wants to let Liz see. Sure enough, a glimpse of something suspicious slips through: Rosa violently pushing Max away from her, with the words “A fraudulent zodiac” written on her hand. Liz seems too overwhelmed with joy to notice anything off about this last memory, which is weird since Rosa’s clearly upset and it doesn’t tally with Max’s claim that they didn’t know each other well. In any case, there’s plenty to be worried about in the present day where Max is concerned, because boy is losing it! His and Jenna’s investigation of the Crashdown Diner shooting leads them to local racist monster Wyatt Long, who later gets apprehended trying to beat up Liz’s poor sweet father, Arturo. Max has a full-blown rage blackout and almost kills Wyatt on the spot, like he’s the extraterrestrial Punisher. After Michael intervenes, Max confesses that ever since resurrecting Liz, it feels like there’s “poison inside of him,” and I’m no doctor but maybe ease up on all that nail-polish remover you’ve been chugging, my dude! Liz’s suspicions about Max start to grow when Maria tells her that “a fraudulent zodiac” is a Third Eye Blind lyric Rosa wrote on her hand the night she died. (I guess Rosa was too much of a rebel to put angsty song lyrics in her MSN Messenger status like the rest of us.) Kyle also digs up Rosa’s toxicology report, which turns out to be a fake, and her autopsy photos, which show a pretty horrifying alien handprint across her face. All the evidence points to Max having done something terrible to Rosa, which of course means that this will turn out to be a red herring, but that sunset kiss at the turquoise mines surely isn’t happening. Liz is giving Max mixed signals for an extremely good reason, but Alex is also giving them to Michael in the wake of their kiss, for reasons that don’t become clear until late in the episode. He keeps finding reasons to show up at Michael’s RV, but also insists that “what happened at the reunion can never happen again,” but also doesn’t want Michael to leave town now that he’s being evicted from the ranch. Michael’s good at acting like he doesn’t care (when Alex shuts him down, he instantly retreats into “whatever, I was wasted anyway” mode), but in private he gazes wistfully at a photo of himself and Alex in high school. It feels significant that Michael keeps this photo in the same box as his pictures with Max and Isobel and the alien artifacts from his home planet; Alex might be the only thing from Earth that he holds dear. “Every time you look at me, I’m 17 again,” Alex says when all those repressed feelings finally simmer over, “and I forget that the last ten years even happened, and then you look away and I remember all over again, and it almost kills me.” You know what almost kills me? Michael’s response: “I never look away. Not really.” Then they’re inside the RV and they’re kissing, and Michael is tenderly throwing Alex down on his bed, and it’s altogether a lot of feelings to process. The level of intensity and soulfulness that’s coming through in this relationship, after just two episodes, is really something. Over at the turquoise mines, Liz rejects Max while still gently stringing him along with the promise of “getting to know each other,” the better to gather information. As a dejected Max heads to Jenna’s place for a hookup that is simultaneously hot and kind of bleak, Liz returns to Rosa’s grave to declare war. She’s going to find out the truth at any price, even if the truth is that Max killed her sister. • Liz has a fiancé back in Denver! Who is claiming that she ghosted him! I like that even as a psychic alien who can access and manipulate people’s thoughts, Isobel gets her best tea from Facebook. • Not only does Alex not know that Michael’s an alien, he doesn’t even believe in aliens! It’s sort of surprising that Sergeant Manes didn’t try to indoctrinate his family into his alien conspiracy-theory cult. • Michael’s childhood story about running away from his bad foster homes and hiding at the ranch because it was the last time he saw his family? And the fact he still lives there to this day? My heart. I cannot. • Maria noticing that Michael “got kinda hot” is a fun shout-out to the beloved Michael/Maria pairing from the original series, but also might be foreshadowing since showrunner Carina Adly Mackenzie has confirmed that Michael is bi! But Maria doesn’t seem like the type of friend who’d go there if she found out Michael was the guy whom Alex has been starry-eyed for since high school. • Couldn’t someone just have Photoshopped that handprint onto Rosa’s autopsy photo? Someone like Manes, who also tried to manipulate Kyle by showing him a photo of his ancestor’s body with a seemingly murderous alien handprint? Just putting it out there. • An important question: Have we agreed on portmanteau names for Roswell’s two major ships yet? Liz/Max is a tough one — “Echo,” as in Evans and Ortecho, cropped up on Twitter and has a nice ring to it. A casual Google search will show you that “Malex” is a way overused ship name, so … Milex? Or some kind of Guerin/Manes blend? And since I have a feeling that Liz/Kyle may sneak up on us, let’s go ahead and figure out one for them, too.